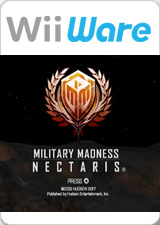 Military Madness: Nectaris (known as Nectaris in Japan): the Military is back for a new generation of recruits! The classic turn-based strategy series Military Madness, a.k.a. Nectaris, is exploding onto the WiiWare service. With an all-new graphical barrage, an all-new commander unit, online team and vs. multiplayer modes, and a platoon of other new features, this is the maddest game in the series yet! 4-Person Online Multiplayer: Coordinate strategies or taunt foes in team or vs. multiplayer modes for up to 4 people. An all-new unit - Commanders: Choose a commander to lead your forces in multiplayer and choose from 20 unique abilities. Multiple command views: Plan out strategy in the overhead map view and watch glorious battles unfold with cinematic camera action. Detailed stat-tracking leaderboards: Increase your rank as you march up the leaderboards on your mission to prove you’re the top general around! The graph below charts the compatibility with Military Madness: Nectaris since Dolphin's 2.0 release, listing revisions only where a compatibility change occurred. This page was last edited on 19 January 2018, at 01:06.